I use music to create another dimension or space that I often juxtapose with the visual space. I think sound is better suited forrepresenting the materiality of the world being portrayed in the image while music has the ability to be more internal, representing the emotions. Michel Chion describes two ways that music serves and affects the image in film. Empathetic music illustrates the feeling and the situation in the scene “by taking on the scene’s rhythm, tone, and phrasing”* and using music’s cultural codes for things like sadness and happiness*. While anempathetic music (with a privative a-), on the other hand, exhibits a “conspicuous indifference to the situation, by progressing [in a] steady, undaunted, and ineluctable manner: the scenes take place against this very backdrop of “indifference”. The juxtaposition of scenes with indifferent music has the effect not of freezing emotion but rather of intensifying it, by inscribing it on a cosmic background,”* with the mechanical nature of the music resembling the essence of cinema. 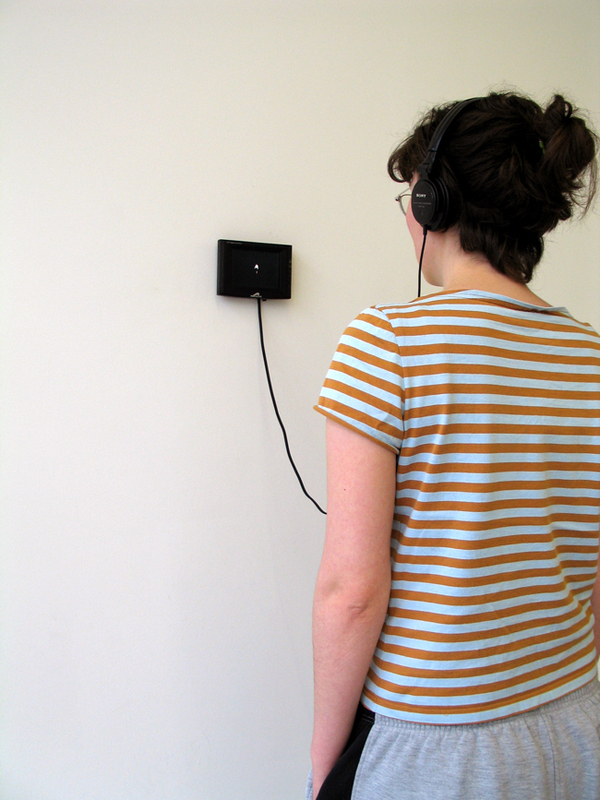 *Margret (2005) is a video/music work displayed on a 12x15 cm monitor with headphones, portraying a miniature female character wearing a white shirt with a little black bowtie, black skirt and white tights. The character is inserted into a black background, partially fading into the darkness in a chiaroscuro manner, the black and white palette reminding of silent film. 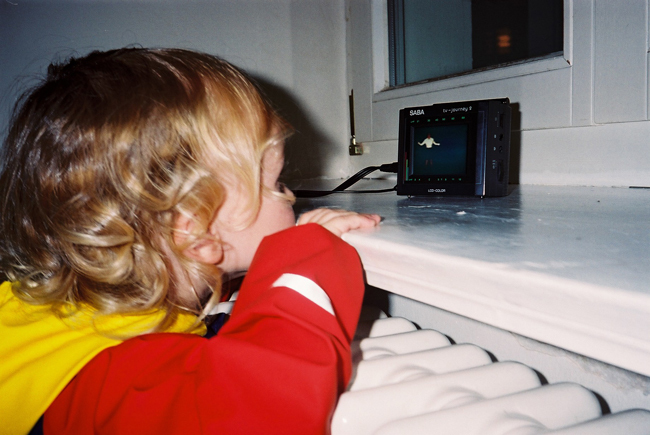 The anempathetic music is a simple, repetitive piano melody, like something from a music box. 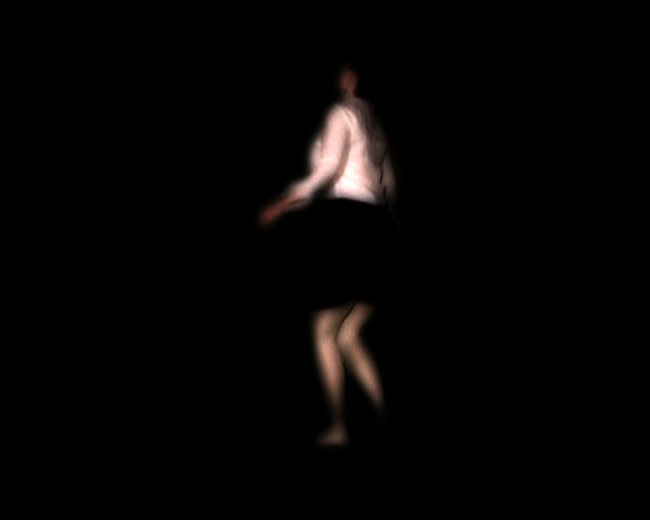 The character turns round and round in the darkness as if being propelled by the music, until she suddenly falls down and disappears into the darkness. The music stops. The character rises, dusts off her costume and continues to turn, the music starting over again. 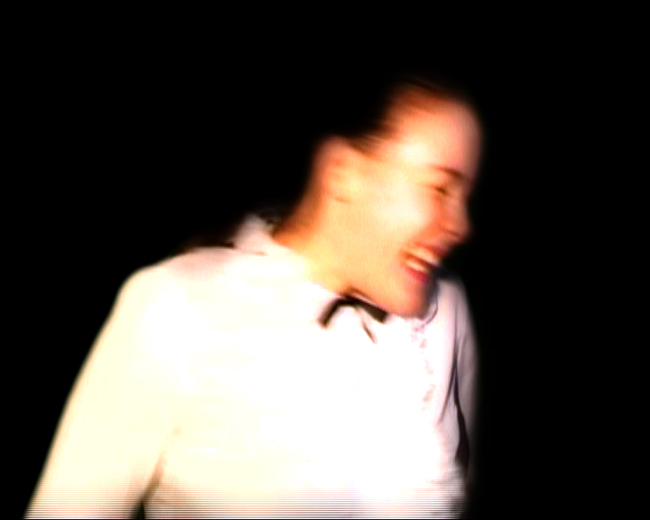 The camera zooms in on the character with a clumsy, mechanical motion, revealing her laughing, enjoying the rush of the movement, until she falls again and fades into the darkness, this time the music continues. The character rises again and continues the same compulsive act, only to fall down again and again and again, the music repeating the same mechanical melody, only the hit on the piano string becoming more intensified as the character’s behavior reveals its self-destructiveness. Once more the character rises, the music starts from the beginning and together they continue turning, until the music and image fade out.